Cherries are one of North America's only native fruits, although they grow around the world. They are summertime staple for fruit lovers, as they are an unbeatable fruit to enjoy when in season. Plump, ripe cherries can't be missed! Whether you enjoy your cherries right off the stem or cooked into a pie filling, you'll love our recipe collection. We've got something cherry for all meals, all day. Enjoy! Dim Sum Recipes - Chinese snacks traditionally served with tea. Fudge Recipes - Sweet sugary candy. Peach Recipes - Free instructions of peach cobbler and more. Smoothie Recipes - Healthy fruit drinks. Globally, around 3 million tonnes of cherries are produced every year. The Japanese sakura cherry blossom are a national symbol celebrated in the annual festival of Hanami. 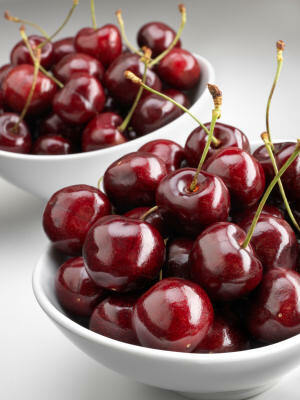 The Australian town of Young is famous as the "Cherry Capital of Australia", and hosting the National Cherry Festival.